Framing store on Charles Street. Not much of a sign for a custom framing shop. I love reflections and this picture is amazing! This is such an iconic Boston shot. It's really wonderful. I've always been fascinated by reflections in windows, I really like this picture. 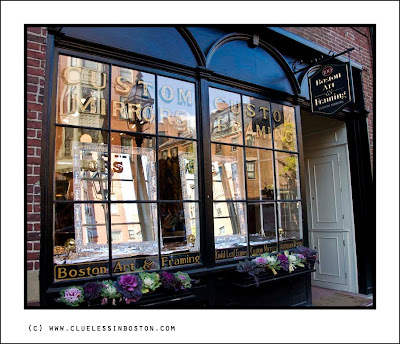 And the shop is very pretty, very typical of Boston I think..
hahahaha! Good one. I guess you go by the rule of finding a interesting place to eat--- never eat at a restaurant that has a sign in the window that reads: OPEN! Perhaps not when compared to many of the other signs above the Charles St. shops ... but very tasteful, nonetheless. One of my favorite signs is the chiropractor office with his artfully curved spine above the door. Excellent reflection, how I missed this? We can be grateful it's not flashing neon. Style, well kept,- and nice reflections. I've always been fascinated by reflections in windows, I really like this picture.